I’ll keep this post short and sweet, as the picture should speak for itself. If he gets that door open…..I’ve got a problem. The real reason I love my Chevelle is not because it’s fast, loud, and way cool (which it is), but because of what this little guy thinks of it. 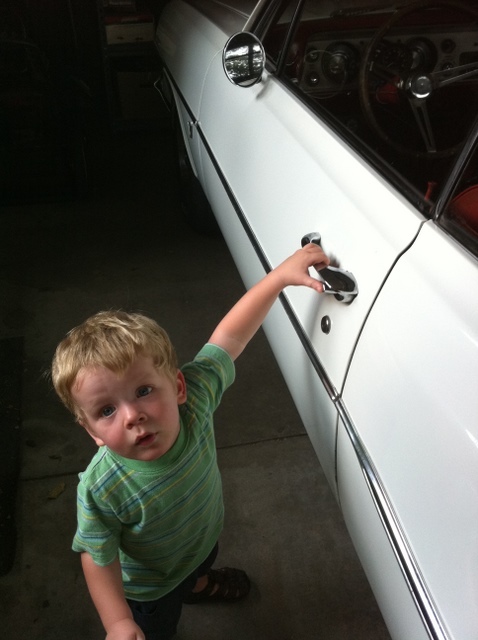 This is my son, and at 21 months old he wants into this car. He wants in it because he’s seen me in it, and he wants to do what I do. It’s the same reason I wanted the Chevelle when I was his age. The dirty little secret about muscle cars (or anything we have a soft spot in our heart for) is that it’s not really about the cars at all. It’s about the people they remind us of, past and present. My mom bought my Chevelle new in 1964. My dad drove it until the floors were gone and the seats were held in place with 2×4’s. We restored it together. It drove my wife away from our wedding, brought my 2 kids home from the hospital, and is getting ready to bring the next one home any day now. When it’s all said and done though, it’s just a car. It won’t come with me when I die, though if God is cool with that so am I. What I really love about my Chevelle is that it’s a rolling representation of my family and friends, and I’m thrilled that one day my son will be driving it. I just hope that he’s too little to get the door open for a bit longer, because he already knows how to start it and he’s an expert at stealing my keys when I’m not looking. I have 69 chevelle ss my Daughters both will say “yeah were going to take dads ss car” when ever we take it somewhere, its almost like it a ride at an amusement park! (I do like to do burn outs when I get the chance…maybe it is a ride like an amusement park! Great artical!